Thaw & de-shell the bag of frozen pre-cooked shrimp. Stripe the skin of the zucchini with a vegetable peeler. Drain any water from the medium mixing bowl. On a separate plate, heat the shrimp for 30 seconds. 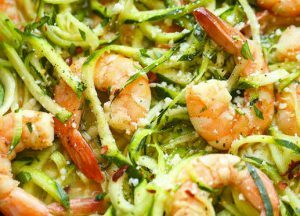 Add the bag of shrimp, 3 teaspoons of minced garlic, 4 tbsp Primal Kitchen Greek Dressing, 3 diced Pepperoncini, 6 sliced olives, & 3 diced, fresh basil leaves to the shredded zucchini, & mix thoroughly. Top with 1/4 cup grated Parmesan & serve. Portions: Women: 3 oz. shrimp over 1 cup shredded zucchini/ Men: 6 oz. shrimp over 2 cups shredded zucchini. A side salad may be added to this meal. Simply multiply the amount to serve others. I thought we’d be venturing into some hot, comforting recipes by now, but instead we have been blessed with some hot, comforting weather for an Indian Summer! It’s a good thing too, because the zucchini & squash season is long-lasting here on the North Fork, which inspired another tasty rendition of zucchini for you to enjoy! This time, I created a dish with a light, Mediterranean flavor to it, using some ingredients that I’ve been enjoying in salads, lately. We hope that you’ll give this one a try. It’s both light & refreshing.